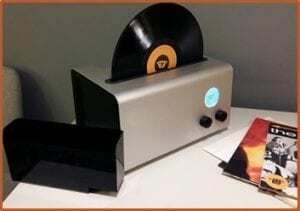 Record cleaning machines are the safest, most scratch-free way to keep vinyl records clean. With vinyl records making a comeback, (Source) more vinyl is spinning on turntables. But some of that vinyl has been stored away for years and may have accumulated dust and dirt. You can choose manual cleaning to maintain your collection, but it often just moves dust around on static-prone vinyl and it can result in damage to the record. Manual cleaning may cost less than a record cleaning machine, but is it worth the risk to your most rare and priceless albums? Some record cleaning machines use a vacuum system (Source) to safely remove dust from the tiny grooves of a vinyl record without causing damage. Meanwhile, others use ultrasonic cleaning technology and drying via blowers to clean records. There’s nothing worse than seeing dirt on the needle. Here’s a review of the top-rated record cleaning machines that will prevent it from happening. 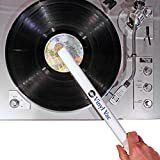 The Vinyl Vac 33 features a wand that attaches to a vacuum. It is highly effective because vacuuming guarantees access to the groove of a record, which is roughly 1/10th the size of a human hair. However, stick to a wet/dry vacuum hose for efficiency because you are bound to clean the record after wet cleaning. Included in the kit are two suction reducers that allow you to regulate the amount of suction desired. Additionally, there are felt strips located on both sides of the suction opening to prevent the hard plastic from riding on the record surface as you spin or turn it. Moreover, the set contains an O-ring that will facilitate a snug fit between the wand and your wet/dry vacuum hose. The unit also comes with replacement pads, which ensure you can clean numerous records and the wand will still look and function as if it is brand new. Finally, the soft velvet pads that surround the Vinyl Vac 33 help protect your record when vacuuming. However, it is essential to note that the manufacturer recommends you use the wand as the final step in a process that involves wet cleaning first. The Okki Nokki features a machine, a plastic vacuum arm, a goat hair cleaning brush, an aluminum record clamp, a cleaning fluid concentrate, and a detachable AC power cord. Additionally, it is made up of a heavy-duty motor/turntable and a vacuum system encased in an aluminum chassis. The forward and reverse turntable motion facilitates extensive groove scrubbing to get rid of grime and dirt. The only requirement is that you use the goat hair cleaning brush provided because it helps reach those difficult to reach grooves. After cleaning, the next step is vacuuming using the suction arm. The suction will get rid of any residual fluid and dirt, then transfer it to the internal liquid reservoir. After every twenty seconds, the internal liquid reservoir empties via a waste tube in the back of the aluminum case. Notably, the entire vacuuming system is conveniently self-cleaning. 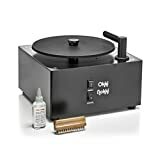 In addition, it ensures that the record is exhaustively cleaned which helps restore the rich and warm sound of your vinyl records. Likewise, the cleaning solution contains no harmful substances that will damage the record. Moreover, it has an aluminum clamp with a rubber insert that ensures the record does not slip. However, note that the Okki Nokki machine is dedicated to only 7-inch and 10-inch records and will not fix scratches or skip problems. 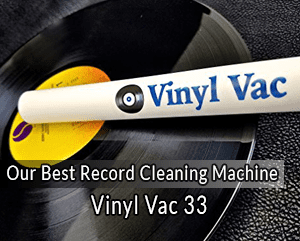 The most significant benefit of using the Record Doctor V is that it provides the same high-quality cleaning provided by pricey record cleaning machines. This is because it features a powerful high-performance vacuum motor and cleaning strip. The only reason the Doctor V is less pricey despite the heavy-duty motor is that the motor does not turn the record for you. That means you have to turn the records by hand. While it can be a bit tiring to do so, it is also therapeutic and enjoyable. Moreover, the product comes fully assembled. Its fluid applicator bottle has 4 oz. of cleaning fluid, too, which is enough to clean dozens of records. That makes it convenient and pocket-friendly. Additionally, it comes complete with a dual-sided fluid applicator brush. The brush is soft and can access the minute grooves as well as facilitate thorough cleaning. Moreover, its hand record turner makes it easier to turn the records by hand. Lastly, its six feet power cord gives you flexibility. 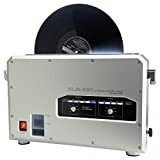 The Klaudio is a fully-automated and high-end record cleaner. To start, it features 200 watts of ultrasonic cleaning power. Second, it boasts a patent-pending technology that requires no brushes or detergent. All you have to do is fill the machine with distilled water, then insert your record. Everything else is handled automatically. The lack of brushes and detergents eliminate the risk of hard-bristled brushes and inappropriate solutions that might damage the record. Additionally, drying is handled safely with blowers. As a result, there is no need to air dry the record. This saves time and prevents dust accumulation. Furthermore, the machine has ultrasonic transducers on either side of the disc, which guarantee a maximum cleaning effect. Now, more about the technology employed: it has a special dampening that reduces vibration and noise. This ensures the machine is not irritating. Also, it allows you to adjust the cleaning and drying process from 3 minutes to 9 minutes. Moreover, to facilitate user convenience, an LED progress bar displays the cleaning status. In addition, the stainless steel reservoir is reliable and durable. It has an integrated drain valve and reservoir access for easy maintenance. Finally, one should note that the machine is versatile because it can clean 11.65 to 12-inch records as well as 7-inch and 10-inch records. With the VPI-HW-16.5, it only takes 35 seconds to clean each side of a record. 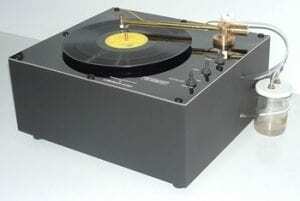 It features a high torque 18 RPM turntable motor. High torque motors have two distinct benefits: First, the motor is long lasting because there is no contact with bearings, which makes it durable. Second, torque motors have a high performance; thus, you get precise motions. Now, in addition to its motor, it also has a vacuum suction tube. Moreover, it is self-aligning, which facilitates an accurate clean. Meanwhile, its cleaning machine has an internal fluid collection system, which provides user convenience. With it, you would not need to empty the dirty fluid. Additionally, the system is made from stainless steel to prevent corrosion. The fluid collection system is also fully enclosed which helps avoid splashing or leaking. Moreover, note that this kit comes with a record cleaning concentrate made up of ingredients that have been tested to ensure they cannot harm your records. However, it is essential to go through the instructions because the concentrate should be mixed with 8 oz. of water to make the VPI cleaning solution. Record cleaning machines range in price from extremely affordable to incredibly pricey. That it is pricey does not necessarily mean it works better. On the other hand, that it is affordable does not mean it is not effective. With that in mind, it is essential to note that your budget is the final determinant. It is about getting the best possible machine in your particular price range. 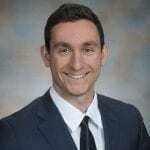 That is why the options discussed above have varying price tags to ensure they cover all manner of budgets. It is essential to note that manual systems are more of kits than machines. Consider the first machine discussed above—the Vinyl Vac 33. It comprises a wand that you attach to vacuum hose. The benefit of kits is that they are affordable, but they do compromise on effectiveness. Meanwhile, most machines in the market fall under the semi-automatic category. They are considered semi-automatic because they have a motor and a vacuum system, but you still have to turn the record by hand when cleaning. Lastly, there is no manual operation on fully automatic machines. You simply insert your record and the machine does all the work for you. However, they tend to be pricey. With dry cleaning, you use a brush that’s usually made from carbon fiber to remove dust from the record’s surface. On the other hand, you use a special liquid to get rid of the stubborn dirt and grime using the wet method. Though all the machines discussed above are wet cleaning, one that combines the two cleaning methods is recommended to maintain good sound quality. First, avoid using vinegar or any other home remedy to clean records. Usually, they are not suitable and often only results in damage the vinyl as well as reduction of sound quality. Second, always clean your records before and after playing them. Next, handle your records with clean, dry fingers to avoid putting dirt on them. Consequently, do not use fabric to dry your records; any fabric can leave scratches. Hence, if your machine does not have a drying feature, then air dry. Finally, use cleaning sleeves to avoid dust accumulation.